The first Post Office was established in 1870. At that time 12 families received mail. In 1896 the number of families had grown to 1500 and the Post Office had outgrown its space. Rather than disbanding the Post Office, five residents donated the money for a new building. Miss Lucy Lowell sold the property for less than half of the value of the property, 72 residents raised the money to buy it and the land was then given to government for $1.00. In 1933 the CHGC planted a garden on a bank across from what was then a railroad line. 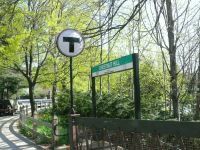 Work at the “T” station, the sobriquet given to our Boston commuter rail service, resumed in earnest in 1970 and later included the adjacent Post Office grounds. On June 6, 1999 a celebration of the renovation and landscaping of the Chestnut Hill Branch of the Post Office took place. Coincident with the renovation of the building, the garden club working with a design by Kenn Eisenbraun of the Planning and Development Department of the City of Newton planted a garden. As can be seen in the “before” and “after” photographs, there was much to be done. The grass was replanted and the gardens adjacent to the building and the newly installed handicap ramp were filled with shrub roses, rhododendron, Rose of Sharon, perennials and spring flowering bulbs. Since then the club continues to maintain the garden each spring and fall. The “Spring Cleanup” prepares the gardens for summer bloom and the “Fall Cleanup” for winter and spring bloom. 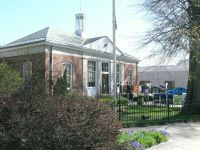 The Chestnut Hill Post Office is located at the corner of Hammond Street and Middlesex Road.